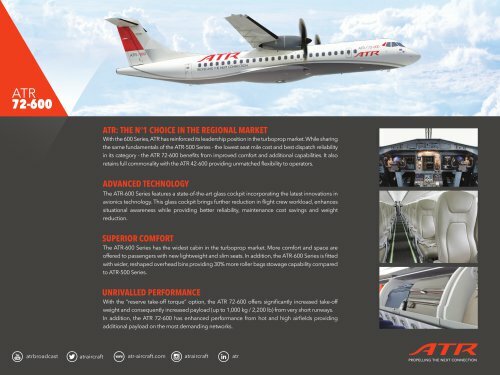 ATR 72-600 ATR: THE N°1 CHOICE IN THE REGIONAL MARKET With the 600 Series, ATR has reinforced its leadership position in the turboprop market. While sharing the same fundamentals of the ATR-500 Series - the lowest seat mile cost and best dispatch reliability in its category - the ATR 72-600 benefits from improved comfort and additional capabilities. It also retains full commonality with the ATR 42-600 providing unmatched flexibility to operators. ADVANCED TECHNOLOGY The ATR-600 Series features a state-of-the-art glass cockpit incorporating the latest innovations in avionics technology. This glass cockpit brings further reduction in flight crew workload, enhances situational awareness while providing better reliability, maintenance cost savings and weight reduction. SUPERIOR COMFORT The ATR-600 Series has the widest cabin in the turboprop market. More comfort and space are offered to passengers with new lightweight and slim seats. In addition, the ATR-600 Series is fitted with wider, reshaped overhead bins providing 30% more roller bags stowage capability compared to ATR-500 Series. UNRIVALLED PERFORMANCE With the “reserve take-off torque” option, the ATR 72-600 offers significantly increased take-off weight and consequently increased payload (up to 1,000 kg / 2,200 lb) from very short runways. In addition, the ATR 72-600 has enhanced performance from hot and high airfields providing additional payload on the most demanding networks.